Products : Chicago Blowers : Design 38 Cast Aluminum Pressure Blower - Draft Air, Ahmedabad, Gujarat, India. Chicago castings blend aluminum with high-strength alloys to create strong, corrosion-free housings and wheels ideal for adverse industrial environments. Aluminum also stands up to sub-zero ambients without material deterioration. 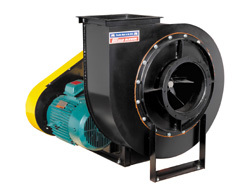 Since aluminum is non-magnetic and non-toxic, Chicago's pressure blowers are recommended for both electronic and food related applications. The non-sparking properties qualify Chicago's pressure blowers for AMCA Type B spark resistant rating. Chicago Blower's new series of cast aluminum pressure blowers fills the diverse needs of high pressure applications from combustion air to fume and dust control to food processing. Fan Sizes 8" to 18-1/2"